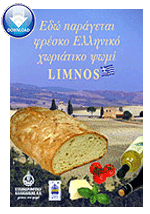 "Zacharoplastikis" - Pastry Flour Soft flour made from fine particle grain size especially for the baking of pastry cookies cakes dies and an endless variety of confectionery. "Ready Cake mix" Special ready mix especially for the baking of vanilla cakes, apple pies, nut pies and an endless variety of confectionery. Tsoureki ready mix Special ready mix for Christmas/Easter sweet bread "Tsoureki". Acquires only yeast and water. Biscuit Flour Special low protein flour for the manufacture of biscuits ice cream cones wafers waffles folds cookies and more . "Kataifi" flour Special flour for pastry production, suitable also for specialty pastries. Flour for "Pita bread" Flour t. 70% specific for the production of pita bread. Coarse semolina durum wheat Derived from 100% vitrious durum wheat corn with high protein. Ideal for manufacturing semolina "halva" "ravani" cake "samali" etc. .
Coarse semolina durum wheat Derived from 100% vitrious durum wheat corn with high protein. Ideal for manufacturing semolina "halva" "ravani" cake "samali" etc..